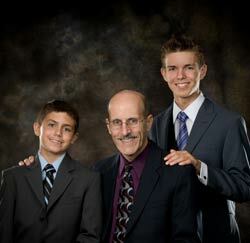 It’s true … Pastor Doug Batchelor was once a teenager! In fact, as the teenage son of a millionaire father and a hit-songwriting, Hollywood-connected mother, he had everything money could buy—everything but happiness. His search for fulfillment led him to drugs, fistfights, and suicidal fantasies. Lost and without a real future, a cave in the hills above Palm Springs became his home and food scavenged from garbage bins became his daily bread. The happiness Doug wanted eluded him until the day he found and began reading a dust-covered Bible a fellow “searcher” had left in his cave. What’s happened since can only be described as a miracle! Today, Pastor Doug is the president of Amazing Facts, a worldwide ministry taking the everlasting gospel to the entire world. He can be seen around the country on television on Amazing Facts Presents and Central Study Hour. He can also be heard each week hosting the live call-in radio program Bible Answers Live. He is the author of several books, including The Truth About Mary Magdalene, The Richest Caveman, and To See The King. Imagine that: from rebellious drug user without hope to an energetic man of purpose and vision! What’s the secret? Find the answers during MIQ! You'll see that Pastor Doug has the unusual ability to communicate not only to churchgoers, but also the secular-minded and young people all around the world. His down-to-earth approach to Christian living has changed countless lives while effectively sharing Bible truth in a way anyone can understand. Today, Doug Batchelor lives in Sacramento, California, with his wife Karen and has five children. He is also the senior pastor of Sacramento Central Church.